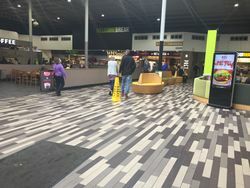 A busy service area at a busy roundabout, consisting of a large and modern building with car parks sprawled across much of the local area. It claims to offer special facilities for truckers. First two hours free for all vehicles, after which cars must pay £15 for a further 24 hours and HGVs, caravans and coaches must pay £33 (or £35 to include a £10 meal voucher). Prices can be paid in the shop and restaurant, with instructions in each car park. They are strictly enforced by ParkingEye. The interior of the large amenity building. The services' site comprises of several things, including a works unit. The only sensible route between the motorways and the village of South Mimms is to leave at the junction and drive through the services, where there is a link road to the village. This feature is pretty much exclusive to the services. The fire meant between 1998 and 2013 it was both the oldest and the newest services on the M25. It was recently marked as a Highways Agency approved truckstop. The original land-owners, BP Express, operate the main filling station here, but not the one exclusively for HGVs. 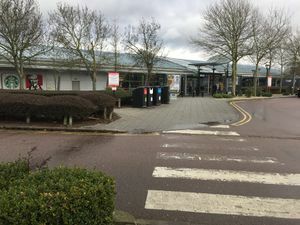 In the government's list of assets, South Mimms services was valued at £2,000, making it the country's least valuable service area. This is probably more to do with the very long (125-year) lease. The services are off a busy roundabout, however its location presents an even bigger problem for the police. Over time, several illegal activities have been uncovered here, largely due to its location being where two major routes cross, one coming out of London (where South Mimms is the first service area you'd pass) and one heading towards the Channel Ports. National Cycle Network route 12, also known as the Great North Way, runs from Hadley Wood to Hatfield via the services, and then it continues towards the North East. The Days Inn hotel here underwent refurbishment and reopened in mid-2016, branded as Ramada. A new building was added next to the hotel in April 2016, which was planned to become a Frankie & Benny's, but opened as a rare example of a franchised Ed's Easy Diner. The trial brand represented Welcome Break's efforts to increase their share of the restaurant market. The store closed in April 2018, and reopened as a PizzaExpress on 8 June 2018. The motorway network's first Pret a Manger opened here on 24 August 2016. The services were mentioned in Ian Sinclair's book 'London Orbital', which came to the conclusion that it was dire and in need of a refurbishment, with traffic queueing to leave the site and join the main junction. A few weeks later, he said things had improved. They also starred several times in Sky's 'Brainiac: Science Abuse' and 'EastEnders', and Robbie Williams has sang in the car park. Roger Green wrote a book on the services titled 'Destination Nowhere: A South Mimms Motorway Service Station Diary'.